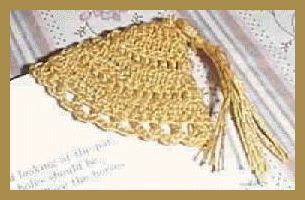 Paper bookmarks often fall out but this crocheted corner bookmark will mark the spot and stay where you put it. Row 1-Ch 4, 3 dc in 4th ch from hook, turn. Row 2-Ch 3, dc in same stitch, 2 dc in each of the next three stitches, turn. Rows 3 thru 5- Ch 3, dc in same stitch, dc in each stitch across with 2 dc in last stitch, turn. Row 6- Ch 3, dc in same stitch, 2 dc in next stitch, dc in next 10 stitches, 2 dc in each of the last 2 stitches, turn. Row 7-Ch 3, dc in same stitch, 2 dc in next stitch, dc in next 7 stitches, 2 dc in next stitch, dc in next 6 stitches, 2 dc in each of the last 2 stitches, turn. Row 8- Ch 4, skip next stitch, sc in next stitch, (ch 3, skip next stitch, sc in next stitch) across. Fasten off. Hold wrong sides together, match the stitches, going thru both sides, join with sc in end of row 7, sc in the end of the same row, 2 sc in each of next 6 rows, 3 sc in corner, 2 sc in each of the next 7 rows. Cut 2- 6 inch strand of thread, set aside. Wrap some cotton thread around your 4 fingers about 10 times starting with thread down and ending with end down. Take one 6 inch strand and run it thru your finger and knot off at the top loops. Take the strands off your fingers and cut bottom loops. Take the last 6 inch strand and fold it in half and tie around one third from the top. Cut any extra threads. Attach to top corner of your corner bookmark. Make lots of these fast bookmarks. I always have several pages marked in craft books. I usually used paper slips to mark pages but they always fall out – these crochet bookmarks tend to stay where I put them!